NB. Title shamelessly borrowed from Paul Swydan for the Boston Globe. I figured, since I’ve written three (at least) stories about the Red Sox, I had something of a connection and authority to speak on the lineup for the 2015 Red Sox. 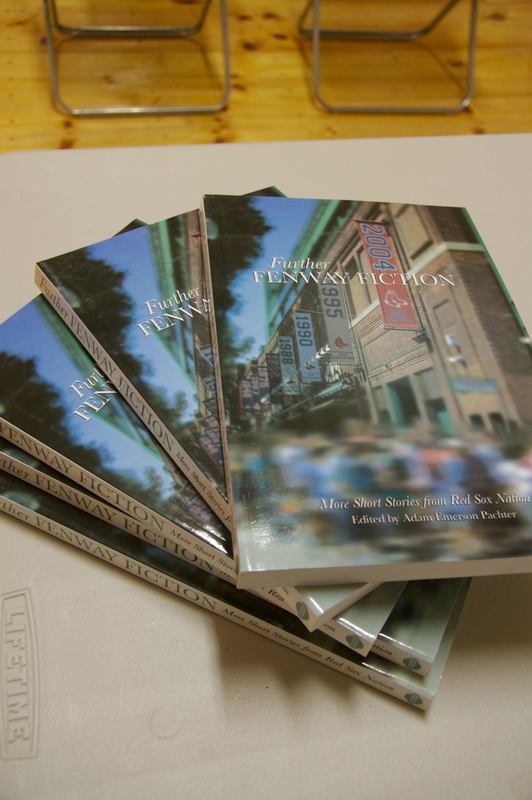 Especially seeing as each year one of our anthologies (Fenway Fiction, Further Fenway Fiction, and Final Fenway Fiction) has been published the Red Sox have either just won or are going to win the World Series. John Henry, John Farrell, give me a buzz, we’ll talk. I appreciate Paul’s practical approach in this age of sabremetrics, but I think he missed out on some glorious opportunities. You don’t need the big power hitters of yesteryear, not since the Red Sox have signed each and every outfielder in Major League Baseball, leaving the remaining teams with scraps, the ghost of Johnny Damon’s arm, and a wind-up toy which houses a holy relic of Dom DiMaggio’s eye glasses inside a hollow in its head. According to statistics, the Red Sox played 784 players last year at the Major League level, which is more than any other team in the history of baseball. For such a record, they were awarded 27 more “pity wins,” which Larry Lucchino has assured the Nation ensures them a playoff spot and, in advanced simulations, they won the 2014 World Series against the Pittsburgh Pirates. In order to fit that number of players on the roster again this year they will also employ David Ortiz, who has been relieved of his DH duties by an adamant Jon Lester, who will only return if he gets a chance to hit (according to Ken Rosenthal’s brother Ken), as a designated leg breaker. Legs will be broken to ensure each player gets equal playing time in an already crowded situation. To Chad Finn’s delight, Giancarlo Stanton has agreed to waive his contract altogether and will play the ukulele for the Red Sox in the clubhouse and host a reality show with Billy Costa and Tito Francona on NESN. He will no longer play baseball, though, for legal reasons, he has to say he plays for the Florida/Miami Marlins, which no one will be able to verify, since all their fans are at the Florida Panthers games. Can’t wait for 2015 Truck Day! My kids have no idea that the Red Sox are not supposed to win the World Series every few years. My son was born a year or so after they won in 2004 and my daughter had the consideration to be born in between games of the 2007 World Series against the Rockies. And that’s not even getting into the other sports teams from my home land and their successes. But now that the baseball season is over, and, for Red Sox fans, it’s ended in such a satisfying, shocking way, the Red Sox fan in your life may be feeling at loose ends with him or herself. Well, no more, I have your solution! Further Fenway Fiction is possibly my favorite of the three Fenway Fiction books and came out during that summer of 2007*. I had really thought, when John Lackey was shut down in 2012, that I’d have another parallel to draw to the main character in my own “The Curious Case of Doctor Belly and Mister Itcher,” which was a story about a successful pitcher who gets hit in the head with a line drive and is never quite the same again. The original inspiration was a Matt Clement-like pitcher who showed such promise and just never seemed to pan out for the Red Sox. But Lackey really pulled it together and man, what a finish! So if your favorite Red Sox fan is suffering from withdrawal I would have a heart, if I were you, and go pick up a copy of Further Fenway Fiction (they’re going for less than $5 on Amazon right now!). Tell me about your purchase, of any book, really, and I’ll send you a signed bookplate to paste in there. * Interesting historical note: Fenway Fiction was compiled during the 2004 season, Further Fenway Fiction was published during the summer of ’07, and Final Fenway Fiction came out in January of 2012. The latter obviously took a bit more time to work its magic, but someone may want to call Larry Lucchino or John Henry and just put all the Fenway Fiction writers on the job, because it’s apparent that our collections are driving the Red Sox to World Series wins.